Exhaust systems are an integral part of a well-running car. Not only does the exhaust system keep the engine cool, but it also protects the environment from harmful gases, like carbon monoxide. In today’s blog post, Shannon Family Automotive would like to share with you some simple tips and reminders for identifying exhaust problems. Having exhaust issues? Need auto repairs? We’ve got you covered. Stop by our auto shop today. We are Folsom’s top auto service center for Toyota and Honda repairs. We can handle everything from routine car maintenance to transmission replacements. Learn more about us, our auto services, and contact us today to schedule an appointment. While the muffler is full of sounds, rattling and thumping noises are not normal. If you hear rattling sounds, this may be a sign that your catalytic converter is starting to age and the interior parts are starting to degrade and rattle around. A heavier thumping noise is indicative of a mounting that has come loose or has been damaged. If this is the case, it is important to fix the problem immediately. Your promptness could be the difference between replacing a little piece of rubber and having to replace the entire exhaust system. Although carbon monoxide is odorless, the other gases emerging from your exhaust are not. If you begin to notice strange smells in your cabin, this is a telltale sign that you have a problem. These are not the type of problems that should be ignored. For your safety and the car’s performance, get your exhaust system inspected and repaired if you notice strange smells. If you are not sure what you are looking for or looking at, your visual inspection likely won’t be too fruitful. 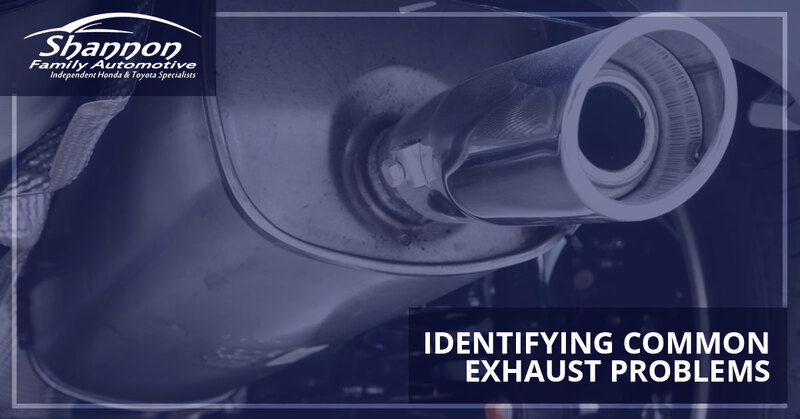 However, doing a little research and examining the entire length of the exhaust, from the engine to tailpipe, will likely help you discover any cracks or holes. When performing this inspection, it’s important to look closely at the areas where one section meets another — for example, the seams between the cylinder and exhaust manifold. Before performing your inspection, ensure that you have proper lighting and, more importantly, that your vehicle has been properly lifted using a safe lift or jack and jack stands. 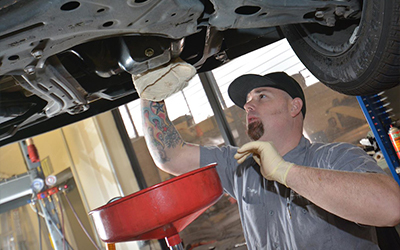 Whether you have a loose mounting, defunct oxygen sensor, catalytic converter problem, or some other issue with your exhaust, experienced mechanics at Shannon Family Automotive can help fix your automobile. Contact us today to schedule a service appointment.